Yes. Hi. Hello everybody! As she said, my name is Karlis and I’m from Catchbox. For anyone unfamiliar with Catchbox can you tell us a little bit about the company and your history? 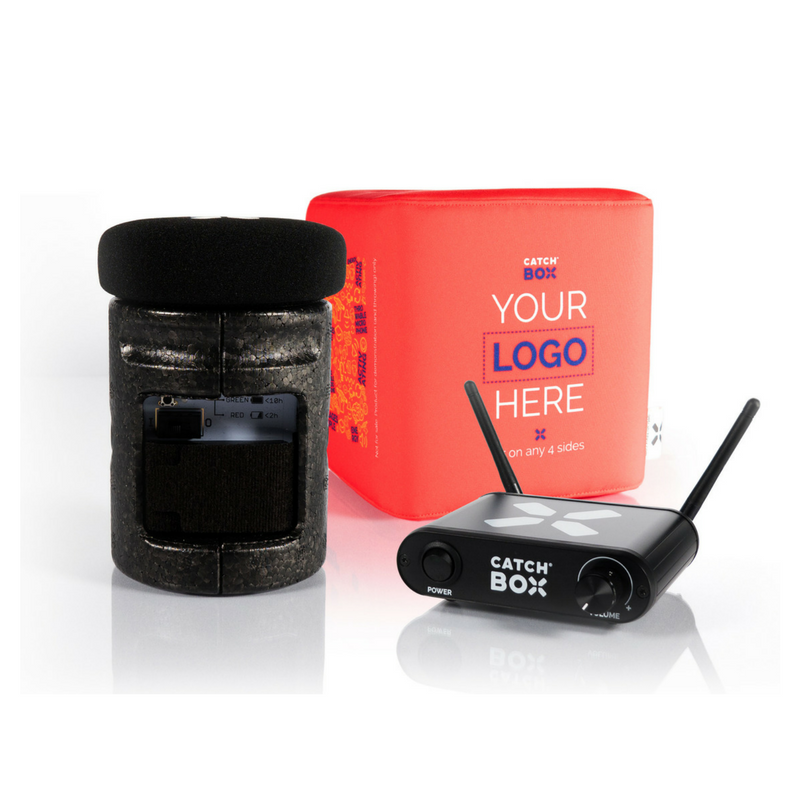 Catchbox is a small company in Europe and we’re an electronic equipment manufacturer. And equipment that we manufacture is microphones. More specifically, throwable microphones. The product was actually born in Finland in Aalto University where our three co-founders studied together and the whole idea came to them when they were looking at the audience microphone being passed around the audience ever so slowly. And they just thought that they can do it better and why not just throw the microphone to the person that wants to talk. And that’s how we advertised with our product. About six years later now we’ve gone through several prototypes from our Kickstarter and now we’re entering a territory where we’re no longer a start-up but a real full-fledged company with real products. How does Catchbox make meetings more engaging? Well, first of all it is the nature of the product and the process when you throw something around it’s not something that people necessarily expect from a Q&A session or from an engagement point of view. So, it really is just the nature of the product and it is a really fun thing to do and it’s engaging. It is something new. Something that can liven up any meeting and any discussion and people mostly when they first see our product, they go “What is this?” and they want to see it. And you can throw it at them. And it also just makes life a lot easier for everyone involved. It’s just a lot less clumsy than the regular microphones that you have to deal with being passed around and it’s very much engaging and it’s engagement proof and it does exactly what it says on the box. It’s a microphone that you throw at people to get them to talk. So, when you throw this microphone at people are you hitting them in the head? Are you hurting people with this thing? Well, we have worked hard on the fact that it is safe to throw. So, it’s very light and it has a lot of padding and while we do not advertise you throwing it at people’s heads it’s very unlikely that they are going to get into any trouble if you do hit someone. I personally have always been a very shy person, especially in public situations. So, stepping up to a microphone to ask questions in front of people has always terrified me and I was wondering if you think that Catchbox makes speaking in public a little less intimidating? This is something that is very relatable to me as well. Because I’ve always had trouble with anxiety when I’m speaking in front of an audience. And this is another great thing about the product because it’s not like the regular microphone. It’s just a different form, it’s a different shape and it’s more playful so it’s not as intimidating when you hand it to a person and if they’re still stressed, they can just play with the soft cover and kind of use it as a stress releaser. And we have had a lot of great feedback from both K-12 and universities using them as something that is helping with the stress and it’s helping with engagement with the younger audiences as well. And you can also make a little joke about how you can hold onto it for safety and then you can play with it and do what you want with it basically. That’s kind of how it works. 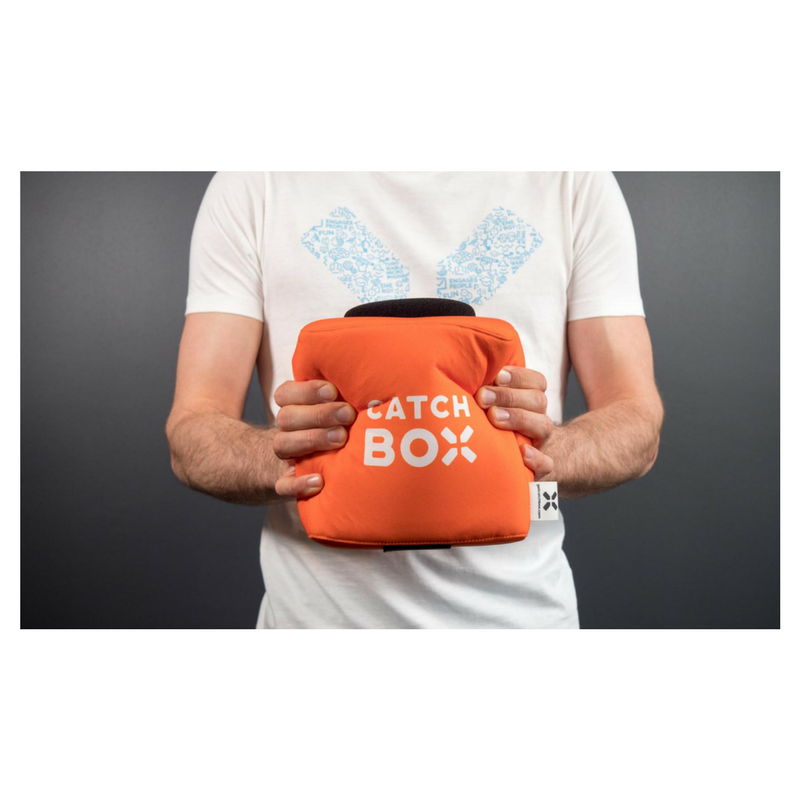 Who is using Catchbox and if you could give us a few examples or case studies where Catchbox works really well? We have three target audiences for the product right now. First of all, it is education. Mainly it is toward the universities but also with K-12. And this is ideal for the student body. It adds some gamification to the whole thing and it lets everyone’s voice be heard even people way back at the end of the auditorium can be able to speak as well and be heard. That is one of our target audiences. And this is also one where we are currently seeing a lot of success. And then events is another one. So, for events it’s good for audience engagement just because you can get more people to speak up because you can physically add more questions when you’re spending less time to also get to the people that want to ask questions and it makes the microphone’s job easier because they don’t have to pass it around that much. They can just throw it at people. And it’s of course great for any event. You can imagine all the photos where you have people smiling and being happy and playing with the Catchbox. And another audience that we have is corporate clients where they are being used in internal training or in an all-hands meeting. Even for conference calls. And it’s just another way to interact with employees. It’s an ice breaker, easier communication there. There are also several ways you can use it. We have some more unusual audiences as well that we have lately seen. For example, a house of worship is now becoming more of a center for communities and then they have a lot of people to engage there as well. They have also used Catchboxes there and co-working spaces have started using them. We have MBA fan clubs are using them. Some sign-up communities are using them. So, really the sky’s the limit with where you could use a Catchbox. You have three different options for these events. The pro, the lite, and the plus, so I thought we’d just go over quickly the product options so that people now what you offer. We do have three products right now. The lite is actually the first product that we produced and it’s a very simple concept. It’s a plug-and-play concept where you have a receiver and you have a built-in transmitter in the microphone, so we have all wireless communication running there at a frequency of 4 GHz. So, thankfully what you’re getting is a quick plug-and-play way how to get a good Catchbox experience. 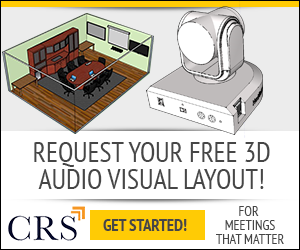 For classrooms or meeting rooms you essentially just want it to be quick and easy. At the same time, we also have the pro and the pro in this case means that it’s more for the professional audio/visual crowd. Because here we are including our microphone, we are including our patented auto-mute system, but we’re not including the transmitter. So, eventually for our wireless communication you would use a third-party product from Alesis and Senniheiser, AKG, you name it and it would use that from these manufacturers for the wireless communication. So, that just gives you the opportunity to work with the equipment that you’re already used to working with. And the plus is our newest product. So, in the plus product we have the experience and all the lessons learned from our previous products and while generally speaking all of our products still visually look the same, they are all the same shape we have again changed the wireless communication. We have provided our own wireless communication except this time it is running on a 1.9 GHz. So, it’s a lot more interference free range for the frequency there and it gives us greater range than we can achieve with the Lite and it also gives us the possibility to attach two microphones to one receiver. So, it’s also our first multi-channel receiver there. And on top of everything else we also learned that batteries are quite a pain because people forget to turn them off and then the batteries wear out. So, in the plus we’ve introduced wireless charging and a wireless charging base where you can just rest the Catchbox when it’s not in use. And then when you pick it up from the wireless charging base you can start using it. So, it’s really an all-around convenient product and very much aimed at universities. We also have product cases because just in case we had a lot of people who were doing training seminars or traveling all over the country so there’s also the ability to add a travel case, so you can keep your Catchbox product safe and sound for when you’re traveling. At Conference Room Systems, we are all about live streaming. And I was just curious about if you wanted to live stream your events or your university lecture how does Catchbox integrate with something like that audio-wise? It’s actually pretty good for live events. As I already mentioned, the auto-mute system which effectively works on the movement so when you throw the Catchbox it auto-mutes itself and that means that you don’t have any wind noises, you don’t have any weird bumps going through the audio from when someone drops it. And this is something that actually makes it really good for live events and for recording live events as well because it will make all of these adjustments on the fly which means you don’t need someone to be working with the audio to cut all that stuff out. And that is also how Catchbox are used. We have a few podcasts that are actually being run by using a Catchbox microphone where there will be a panel discussion and you just throw the Catchbox to whoever is the person that is speaking next. 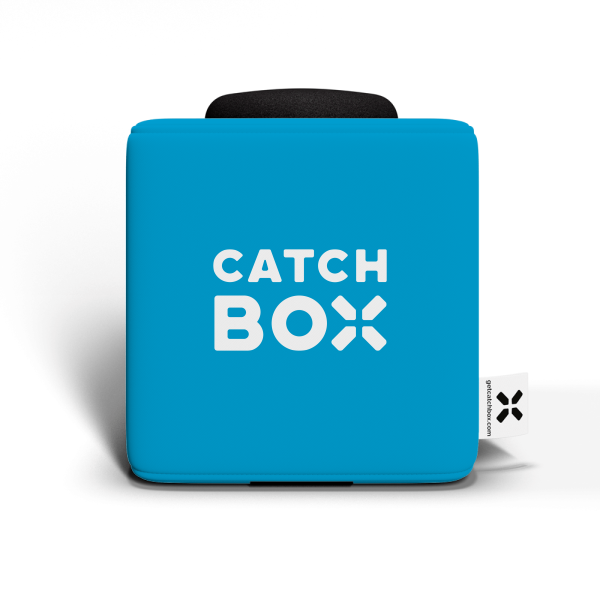 My very last question is what’s in store for the future of Catchbox? Well, that is a very good question. Well, right now we’re working on a couple of new products and this idea is to essentially complement the new products that we have and to build a more coherent solution that we can offer to our clients. Unfortunately, I can’t really disclose much right now although hopefully around February we’ll be able to open up a bit more news regarding what are the next steps that we are taking. But we are always learning. We’re always learning from the partners that we have and we’re always learning from the feedback that we receive. So, we are continuously developing the project line up.